Finding Rare Images of Antietam in New Jersey ~ The History Girl! An unfortunate fact about early photographs of Antietam Battlefield is that there are darn few of them. Unlike Gettysburg, Pennsylvania, where photographers roamed the blood-soaked fields continually after the armies left, the town of Sharpsburg, Maryland was in the theater of war for years after that battle, the area was in a depression for over a decade, and the town had no professional photographers. 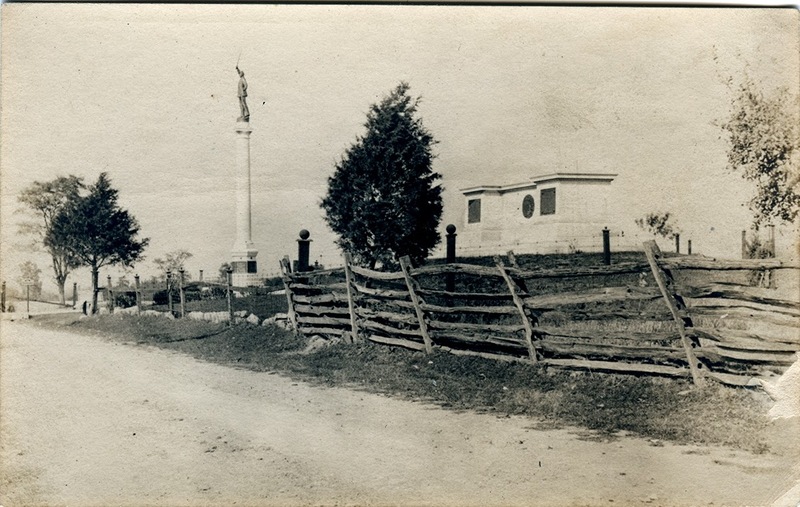 Looking north up the Hagerstown Pike toward the New Jersey Monument at Antietam, circa 1920. Courtesy Stephen J. Recker Collection. Because of these and other factors, the famous Bloody Cornfield remained unphotographed until the 20th century, or so I thought until I stumbled upon an amazing cache of early Antietam Battlefield images hidden in plain sight hundreds of miles from my western Maryland home. This is the story of how I unearthed those images and brought them to light in my book Rare Images of Antietam and the Photographers Who Took Them. One snowy winter morning some time around the year 2008, about four years before my book was published, I sat at my desk perusing the Internet for any hint of obscure Antietam photographs. Six years into researching my book I had hundreds of great images to show for my efforts. But I was starting to cast my net wider to make sure that I had not missed anything. I got a hit at the New Jersey Historical Society in Newark. Ezra Ayres Carman had his papers there, and the finding guide said that, apparently, there was one image in the lot. Carman commanded the 13th New Jersey Volunteer Infantry at the Battle of Antietam, and they fought right through the Cornfield. Could that one photograph be an early image of it? The possibility was good enough for me. Road trip! 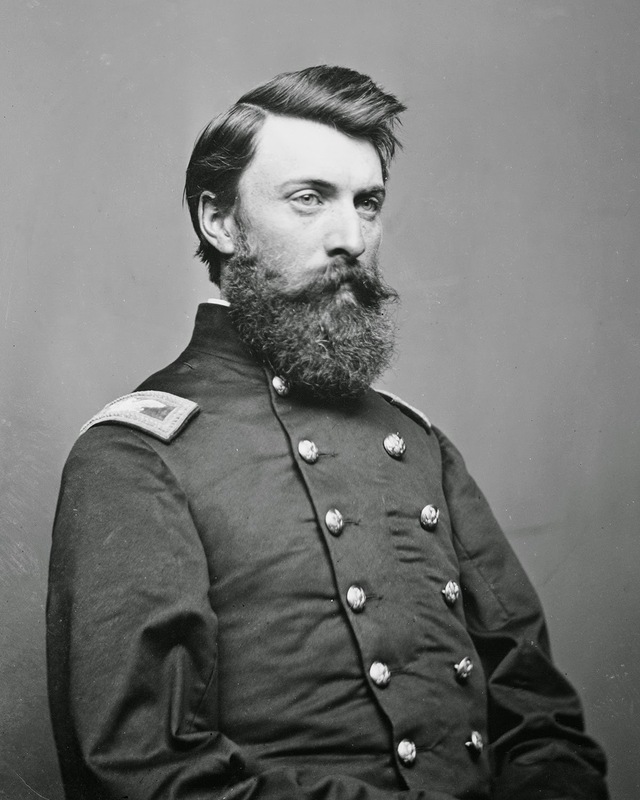 Colonel Ezra A. Carman, 13th New Jersey, Army of the Potomac. He was born in Middlesex County, New Jersey. Courtesy of Antietam National Battlefield. The Society would not be open until noon that day, so I sent them a quick e-mail to let them know I was on my way and headed off to my target in the Garden State, 230 miles away. Upon my arrival I scored a parking spot right on the street, smack dab in front of the society’s historical edifice. I saw this as a good sign. The librarian, having received my e-mail, had fast-tracked my paperwork and I was at a large oak desk in a flash. Quickly, he presented me with a half-dozen boxes from Carman’s papers, mostly pertaining to his Antietam years. Ezra Carman fought in many battles throughout the Civil War. He kept a diary the entire time and it is a fantastic resource. 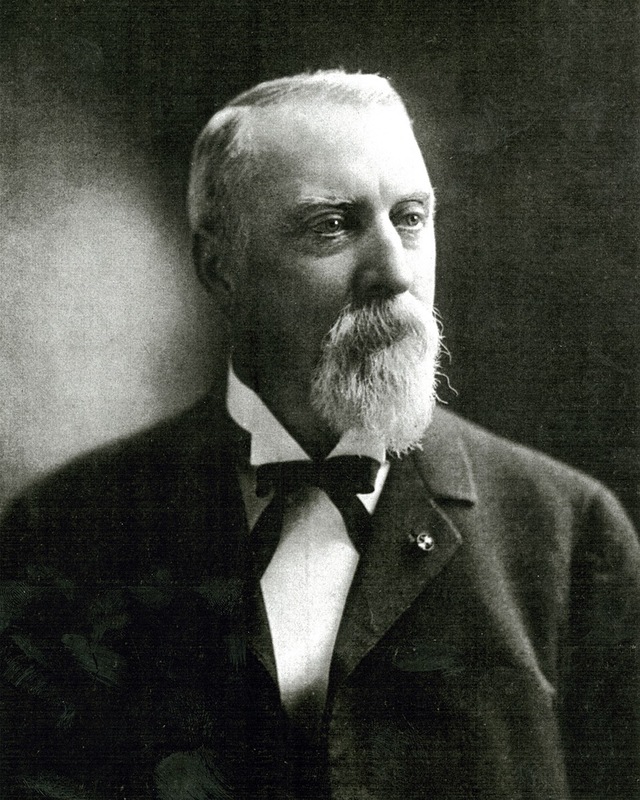 In the 1890s, he became historian of the Antietam Battlefield Board and wrote an 1,800 page manuscript which, although unpublished until recently, is considered to be the authoritative text on the battle. That was all well and good, but I was looking for photographs. I found a hand-made leather-bound diary titled “New Jersey at Antietam” that was Carman’s scrapbook of the creation and dedication of the New Jersey monument, dedicated at Antietam in 1903 by Theodore Roosevelt. It contained the deed for the monument, artist sketches, and yes, the photograph I had driven all morning to find. Alas, the image was actually from a magazine and was taken in the Bloody Lane. It was no great shakes, but the scrapbook was so exciting I already felt the trip had been worth it. 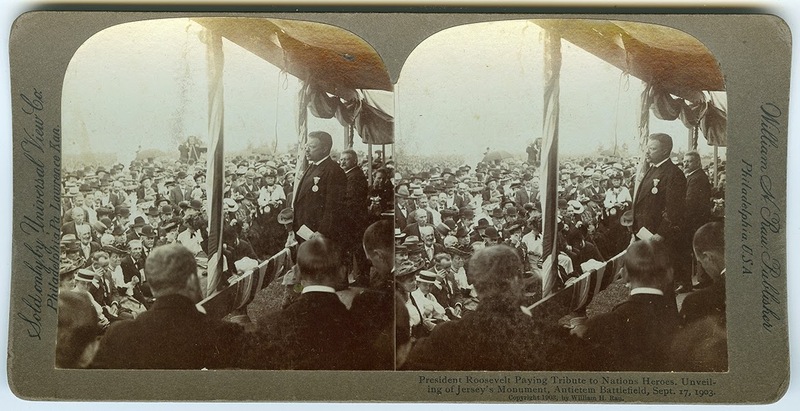 President Roosevelt at the unveiling of the New Jersey Monument, Antietam Battlefield, September 17, 1903. Courtesy Stephen J. Recker Collection. Antietam’s New Jersey state monument first came on my radar when I purchased a nickel that had been left on some railroad tracks and was smashed by the train that carried Roosevelt to the 1903 dedication. And then I read the story of the woman who, just before the dedication, rode past the New Jersey monument in a horse-drawn carriage to show her little boy and husband the place where a workman had been killed during its construction. The horse shied, throwing her and the boy out onto the ground. The child fell under the wheel and was badly hurt, and the mother fell on her head and fractured her skull. She died immediately. Mrs. Francis McGraw is buried in Rose Hill Cemetery, Hagerstown, Maryland. 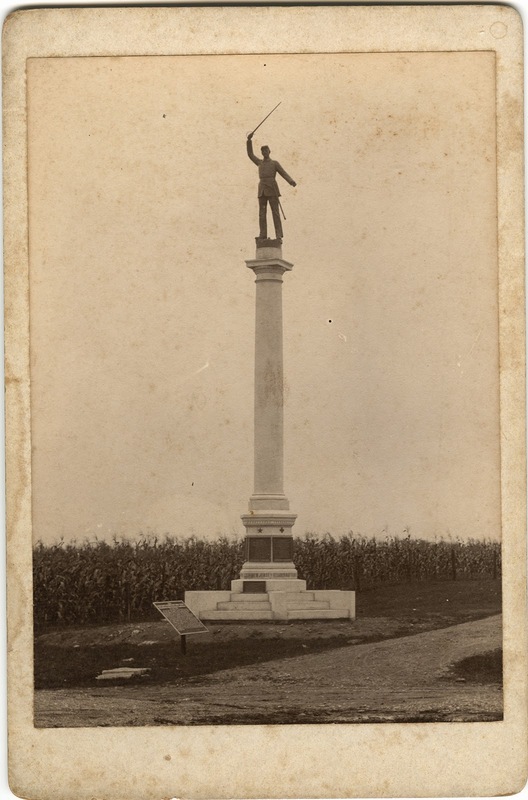 The gallant Captain Hugh Irish, who stands on top of the New Jersey monument, waves his sword and urges his men to follow him across the Hagerstown Pike and into the mouth of Stonewall Jackson’s guns. Shot through the heart, Irish was buried by the side of the road where he fell. His remains were later sent to Paterson, New Jersey, where he was buried in the baptist cemetery at Sandy Hill and subsequently, in 1870, removed to Cedar Lawn. Cabinet card of the New Jersey Monument, circa 1903. I gave the call numbers to the librarian and in short order he returned with no less than eight boxes full of old images. And I am talking A++ quality images. I did not know it at the time but I have since surmised that what I ‘discovered’ that day was nothing less than Ezra Carman’s personal photograph collection. In the 1890s the historian of Antietam battlefield amassed over ninety wonderful and scarce images of the battlefield and years later when his son donated them to the Society they became somewhat disconnected from what would be considered his “papers,” hence the lack of labeling. In the 1890s, cabinet cards were the rage, and stereo views were on their way out. This was reflected in his holdings. Many of the more obscure images were taken by John Wagoner, who at that time had just moved his studio to Hagerstown from nearby Boonsboro. One such image is the earliest photograph of the Cornfield that I have ever seen, circa 1888. A truly amazing find. 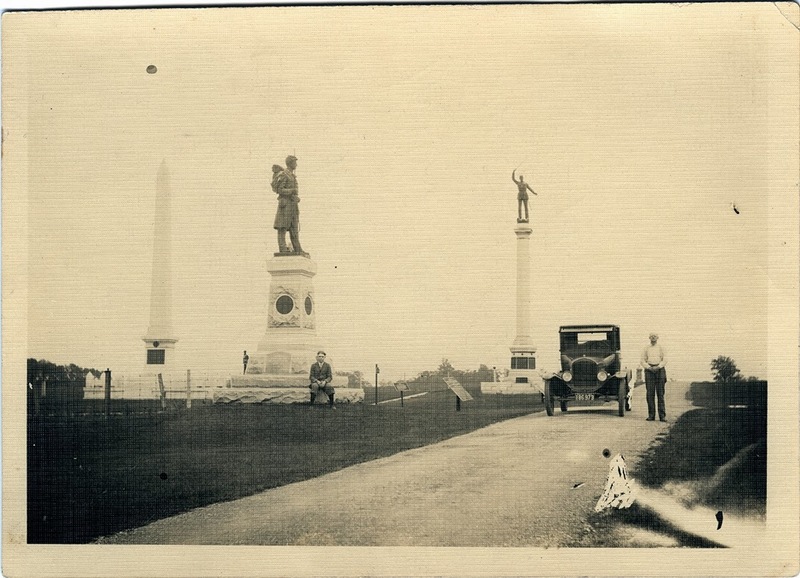 Early photograph looking toward the New Jersey Monument, circa 1913. The Indiana Monument (l) and the 125th Pennsylvania Monument (lc) can also be seen. Courtesy Stephen J. Recker Collection. Also in the collection was a series of images taken in 1900 of the removal of some trees and a fence to make way for the monument to Joseph King Fenno Mansfield, commander of the Union XII Corps at Antietam. Sadly, one of the trees removed for the monument was one that veterans of the 10th Maine Infantry had written about only ten years earlier as having had an impact on their fighting. That said, these invaluable photographs are the only close-up images we have of that old stump. I spoke to the director of the New Jersey Historical Society over the course of the next few years to secure the rights to use some of their images in my book. I was ecstatic to be the one who ‘found’ this treasure trove, but was frustrated that I had to wait a few years before I could reveal my find to the many Antietam historians that I was sure were not aware of these photographs. As my anxiety mounted at the possibility of someone else finding out about these images before my book came out, I made a few more pilgrimages to Newark to refine my photo selection list. But on one last trip I had a special quest. My good friend, Dr. Tom Clemens, having spent the last twenty years or so editing Carman’s Antietam manuscript for publication, was getting ready to go to press with Volume II. Tom asked if I knew of any good images from Carman’s Antietam Battlefield Board period that might work well in his book. I told him I would think about it and headed off to Jersey. 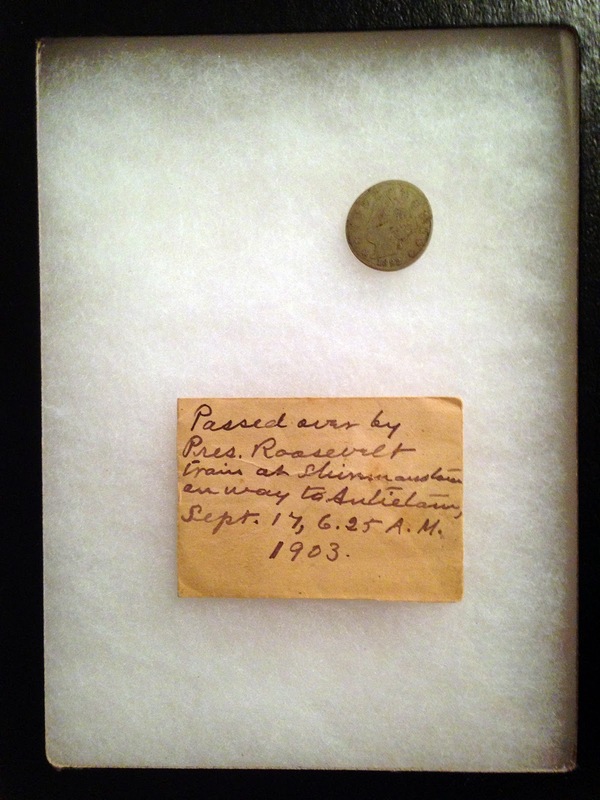 1892 Liberty Nickel passed over by President Roosevelt’s train on the way to Antietam, September 17, 1903. Courtesy Stephen J. Recker Collection. Upon my arrival, the librarian suggested that I might want to look in a few other boxes of images of battlefields that I had not seen previously. After a resounding "Yes! ", he brought out a table full of astounding photographs. But one collection of larger format photographs caught my eye. Although they were not marked, I immediately recognized them as Antietam. Upon further examination I concluded that they constitute a photographic survey of the Antietam Battlefield Board’s work - historic tablets, avenues, the tower, and fences - commissioned by Carman himself. These were about six sets of four images each, taken to create panoramic views, embodying some of the earliest photographs known of the Cornfield, Rocky Ledge, and Nicodemus Heights. Not only was this going to lift my book to an even higher level, but when Tom found out about these he immediately planned a trip with me to go back and see for himself. Ezra Carman, post-war. Courtesy of Antietam National Battlefield. But my glory was short-lived as I was alerted to the fact that the credit line for the New Jersey Historical Society photographs was missing from the printed copies of my own book! How could this be? I had placed it in there as you would lay a golden egg on a pillow. But, it was true. About a week before my book was put to bed I received an image of memorial windows that were placed in a church by someone who was featured in my book. I knew it was a bad idea to add content so late in the game, but I was determined to get it in and added it as a Post Script. When I inserted the credit line to the Newville Historical Society, instead of adding a line, InDesign replaced the line containing the precious New Jersey Historical Society credit. Regardless of the toils, the pursuit of early images of Antietam continues. They are important because if one is to tell the story of a battle with any accuracy, they must know what the field looked like to those who fought. And these early images allow us to follow a thread of truth back through time to see where a road has been moved, or a tree line changed, or a fence built or realigned. Only then can we make sense of the narratives left to us by the veterans who made that ground historic. Q. What is the only regiment that has three flank markers on the battlefield of Gettysburg? A. The 13th New Jersey Volunteer Infantry. Q. What is the only regiment that has three monuments on the battlefield of Antietam? 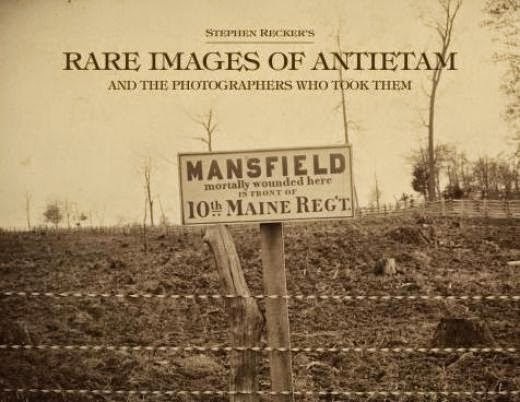 Stephen Recker is a collector of rare Antietam photographs and relics. Items from his collection can be seen on battlefield waysides and in the newly renovated museum at Antietam National Battlefield, as well as in his book, Rare Images of Antietam, and the Photographers Who Took Them. Recker is a member of Antietam Battlefield Guides, a service he founded in partnership with WMIA, the non-profit at Antietam National Battlefield. He produced Virtual Gettysburg, a critically acclaimed interactive Civil War battlefield tour; Antietam Artifacts, a CD-ROM with images of rare postcards from the Maryland Campaign of 1862; and www.virtualantietam.com. He began his professional career as a lead guitarist, recording and touring with Al Stewart, the Spencer Davis Group, Mary Wells, and Tommy Chong, and as technician for Ringo Starr, Kiss, Diana Ross, and Madonna. In multimedia, he produced for Apple Computer, Adobe, and the Smithsonian, and was named a “Top 100 Producer” by AV Multimedia Producer Magazine. He is currently the Web and Multimedia Coordinator at Hagerstown Community College and is a graduate of Boston’s Berklee College of Music.